The Executive Board of KION Group consists of Gordon Riske, Harald Pinger, Otmar Hauck and Klaus Hofer. Gordon Riske has been Chief Executive Officer (CEO) since 2008 and is responsible, among other things, for strategy, communications, governance and compliance, market intelligence and the Group's Asian business. The CEOs of the brand parent companies Linde Material Handling, STILL and Voltas Material Handling report to him. Harald Pinger has been Chief Financial Officer (CFO) since 2008 and is responsible for finance (accounting, controlling, tax, treasury), financial services, IT activities, mergers & acquisitions, investor relations and the Americas region. He held the post of Labour Relations Director until 30 September 2011. Otmar Hauck has been Chief Operating Officer of KION Group GmbH since 2009. He is responsible for quality and central operations, purchasing, logistics and product development in the Group. Klaus Hofer joined the Executive Board on 1 October 2011 and is responsible for human resources, legal affairs, health & safety and internal audit. He also took over as Labour Relations Director on that date. The Executive Board normally meets every 14 days. Apart from preparing and taking all decisions relating to the day-to-day management of the Company, the Executive Board also uses these meetings to discuss and approve any transactions in the brand subgroups that require its consent. A list of the transactions requiring such consent is included in the rules of procedure for the relevant Management Boards. Under its rules of procedure, the Executive Board must have certain transactions approved by other decision-making bodies such as the Supervisory Board or the shareholders' meeting. The Company's Supervisory Board comprises six shareholder representatives and six employee representatives in accordance with the requirements of the German Commercial Code (HGB) and those of the German Codetermination Act (MitbestG). The Supervisory Board is responsible for the tasks specified by law, the memorandum and articles of association and the rules of procedure relating to the supervision of the management of the business by the Executive Board. It also advises and supports the Executive Board in its handling of significant matters and business transactions. John Feldmann, a former member of BASF SE's Board of Executive Directors, has been the chairman of the Supervisory Board since 28 September 2011. He took over as chairman from Johannes Huth, the representative of Kohlberg Kravis Roberts & Co., New York, USA. Mr Huth had assumed the chairmanship of the Supervisory Board on an interim basis from 28 June 2011 to 28 September 2011 after Manfred Wennemer had stepped down from the Company's Supervisory Board. In addition to a human resources committee and an audit committee, the Supervisory Board has set up an arbitration committee pursuant to section 27 (3) MitbestG. Shareholders and employees have equal numbers of representatives on all the Supervisory Board committees. The Supervisory Board normally meets once during each quarter. The committees hold regular meetings (the audit committee meets four times a year, for example); although the arbitration committee only meets if required to do so in circumstances specified by law or by the memorandum and articles of association. If required, the committees also meet between the regular scheduled meetings. The remit of the Supervisory Board and its committees is defined by law, the memorandum and articles of association and the rules of procedure for the Supervisory Board and each committee. A meeting of the Company's shareholders is held as required by the memorandum and articles of association or if demanded by other special circumstances. Resolutions may also be adopted by shareholders using a procedure conducted in writing. 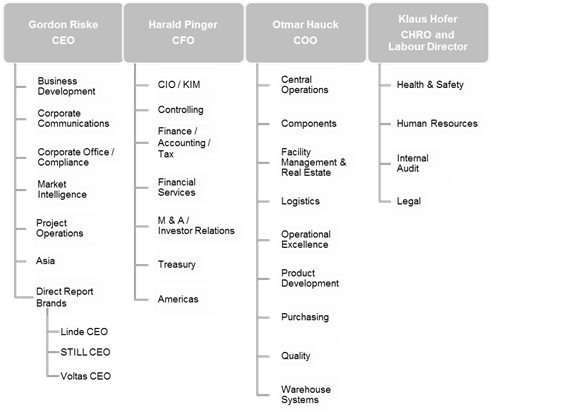 The KION Group publishes details of its corporate governance in a separate corporate governance report on its website: www.kiongroup.com.